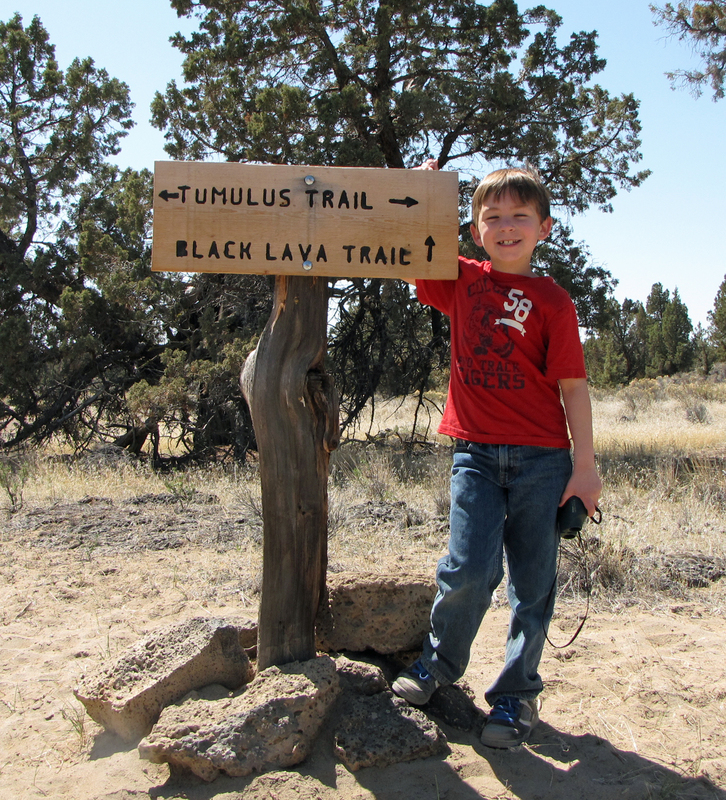 According to the BLM, hikers can reach ‘the heart’ of the Oregon Badlands Wilderness by travelling the remote Tumulus Trail which winds around large lava blisters littered with dark hidden alcoves, dry moats and wide open juniper woodlands. To get to the Tumulus Trail we opted to follow inroads located in the Alfalfa area where Walker and Johnson Ranch roads meet. Perhaps fittingly for this kind of remote area one must pass by the local Transfer Station, and I’m inclined to think that this is just a covert way of encouraging lowly types to leave their trash before venturing any further on down the road. Although, the deeper you get into this area, the more dumped trash and junk you’ll see along the way, so clearly … not everyone is paying attention. However, once inside the Badlands Wilderness Area most of the junk goes away and it’s just juniper, sand and lava rock for as far as the eye can see. Trailhead access is located adjacent to a gate along the main area canal. From Alfalfa, drive ¼ mile west on Alfalfa Market Road, turning south on Johnson Ranch Road for 1 mile to the transfer station. Here the pavement ends and you continue along a rough road south along the canal for 1.2 miles. Park at the wide area east of canal; do not block the canal road. Trailers are not advised. We opted to stop at Renolds Pond Trail before heading off to find the Tumulus Trailhead, and actually, that’s a pretty interesting sight to see – it is quite a big pool of water and clearly one place in the Badlands where waterfowl can can be seen. Although not overflowing with birds we did see several geese and a small colony of ducks. There are also several campsites along the circular trail, so if you plan to walk this spot, expect to bump into some peeps along the way. After a quick trip around the desert oasis, we got back in the truck and headed out to find the trailhead. 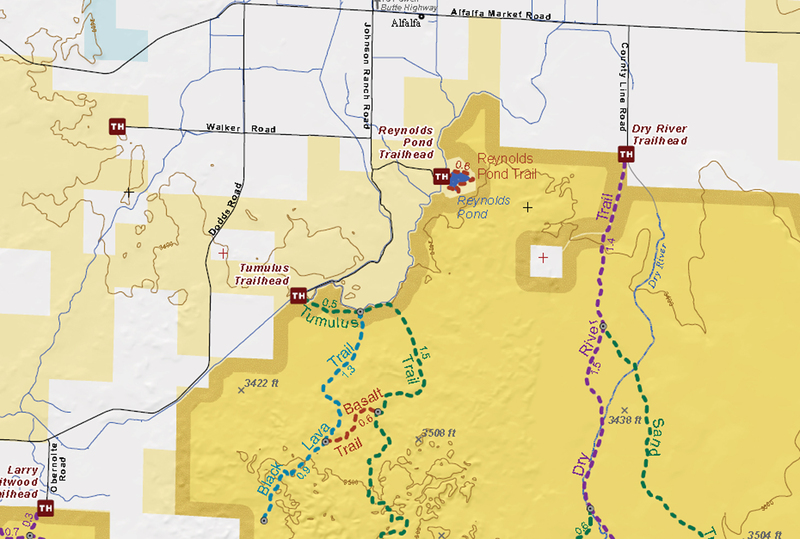 Now, I must tell you that the best map for this is the large BLM area map – do not rely on the little map located inside the Badlands brochure – that one will at the very least, leave you puzzled and confused. The actual trailhead is quite a ways down a winding road that follows an irrigation canal and be warned; there are many (many) off-shooting roads along the way but as long as you stay close to the canal, you’ll get there eventually. Perhaps the most curious thing about this trail is that when you first see the sign to the trailhead, you can’t actually get there from here. To explain that – the sign is visible from the road but it sits across the roaring canal – and one must travel quite a bit farther down the road to where two canals intersect and a walking path begins. Oh, and the walking path is not marked, so you’ll have to just trust me that you’ll eventually find what you’re looking for. Once you reach the gate, park your vehicle and walk through the foot traffic access and head out along the canal. Black Lava Trail and Tumulus Trail create a sort of loop in the desert, and if you opt to try that trek then just walk on past the trailhead sign staying along the designated Tumulus Trail adjacent to the canal. This trail will eventually loop around and take you to the Basalt Trail and from there you can hang a right and wind your way back to where the trailhead sign sits. At least, that is what our plan was for this hike as we were toting an 8-year-old who is just starting his hiking career, so we kept the hike at around 3 or 4 miles so as not to endure a lot of kid complaining along the way. And, for the most part, it worked. BLM is quick to point out that it’s easy to get lost in the Badlands desert – and this trail in particular – so sufficient navigation skills are highly recommended. Keeping your bearings is an important consideration when hiking just about any Badlands trail. They are all very dry and dusty treks along lonely stretches of juniper and lava rock strewn landscapes, and even if you are on a designated trail there will be tons of intersecting trails, pathways, roadways and unmarked turnouts along the way. Also, pack lots of water, wear a hat and keep an eye out for wildlife. Getting there is only half the battle. Surviving the experience will make you a seasoned Badlands badass hiker. Seriously. Just ask that eight-year-old. The Friends of Oregon Badlands Wilderness, an all-volunteer group, are the “eyes, ears and boots on the ground”, partnered with the BLM in a stewardship role. Our stewardship tasks are multiple, including installing signs, like the one in the story (made by a volunteer), replacing stolen signs, reparing vandalized signs, trailhead and trails maintenance and monitoring and removing obsolete barbed wire fence, amongst others. We also do outreach programs, for instance the sign pictured was installed by Portland Montessori Earth School, and conduct Interpretive Tours, when we spend time off-trail, where some of the most unusual formations are to be found. Details can be found on our website. There is an easier way ro reach Tumulus Trailhead. At exactly Mile Marker 6, on Dodds Road, take the dirt road about a mile to the trailhead, continuing right at the first intersection, you’ll see the trailhead sign over the canal footbridge. Awesome good information, David! I’ll be checking out the website for info on unusual formations, etc. as I’m always looking for interesting things to photograph. Thank you so much for that! The route we took for this hike is a good way to go if you want to spend time by the water, and I wonder if perhaps your group could post something at the trail launch point when you first cross over the canals on this route (and possibly at the locked gate leading in). There is a container for maps, but nothing indicating what trails the path leads to or how far it is to the trail head. We’ll try the ‘easy’ route next time for sure! replacement Fobbit brochures, and the ones we obtain from the BLM tend to be sparse in number. Our maps do have the mileages. I have about 100 GPS waypoints, many of them off-trail, annotating unusual formations and areas. I’d be glad to share some of these waypoints with you if you’d like to have a coffee sometime, where I can bring a big map of OBW, and of course, if you’d like to hike with myself and a couple of other Fobbits, including my wife, I’d be glad to arrange. Please keep up the good work! I can just see myself out there in the sandy expanses of the Badlands, sun blazing overhead and me crouched over my seldom used GPS trying to negotiate an off-trail waypoint to get a pic of something spectacular … something best left to the experts in my case, for sure! I enjoyed checking out the FOB website, and I love that you guys call yourselves Fobbits. I might have to join, just so I can associate myself with that term. 🙂 I’d like to offer that the next time you have a fundraiser or if you are looking for volunteers, drop by the HCO Facebook page, and leave a few posts (it usually takes a few in order to rally the masses). You can find that at: http://tinyurl.com/7bofzsv if you haven’t been there already. 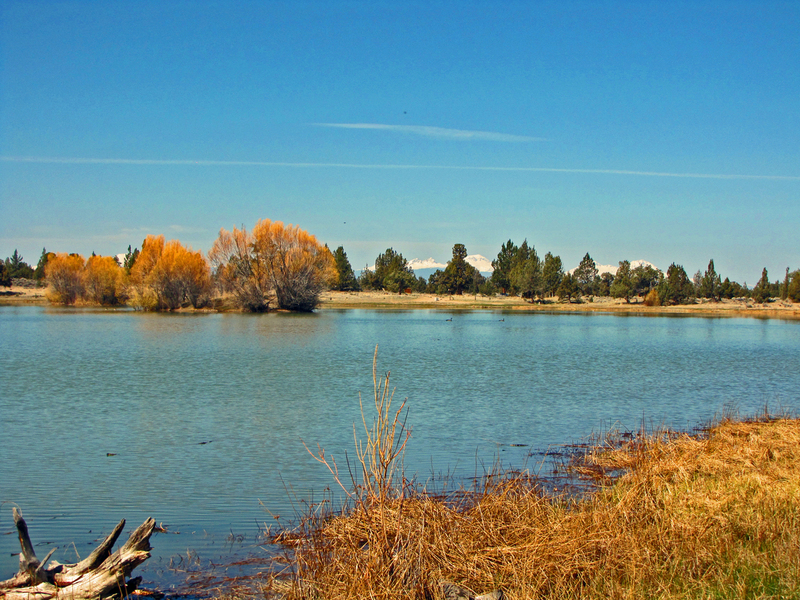 For readers of the Hiking Central Oregon blog I’d like to suggest that you visit David’s official Fobbit page at: http://www.friendsoforegonbadlandswilderness.org. And, regarding maps and such, I was thinking that carry-away maps might be a bit of a challenge for any organization to maintain, but if there was some way to simply post some kind of signage at the gate where the ditches divide and/or then again on the map box itself — that would be vastly helpful for folks just trying to get to the trailhead – since it’s unmarked otherwise. And, I suspect that anyone who manages to get as far as the gate has probably downloaded some kind of map to get there, but confirmation at the trailheads would still be helpful. Awesome good stuff! Thanks again David.